For a long time, I'm planing to create Silent Hill short animation that looks like sidescroller. I created Nurse sprite, I'm satisfied but I also think that it can be better. I want to improve my sprite for a start, but I've also post animation test and mockup just so you can see my basic idea. Every comment is appreciated. I'd only add that you've got a Silent Hill Movie nurse being shot by Silent Hill 3's protagonist. (And I'm one of those stubborn SH purists who only likes the stuff made by 'Team Silent'). Then again, maybe this is based off the new movie, which I haven't seen yet. Looks good. Looking forward to seeing more. I might suggest though, that the first shot move her body back in a different way. .. Maybe her chest would move back a bit and her head would fling downward? Thanks. Good suggestion, head should be moving forward when she is shot in the shoulder. BTW The new movie is bad. As a fan I could say that it's a waste of time. Nurse doesn't feel gritty enough to me. More dirty browns blending into reds and removing the blue and overall whiteness IMO. I'm no expert but don't these things usually show up when the environment changes into to skanky evil land? Background you got now looks more like exploration and suspense time. You planning to do the lighting as an overlay effect rather than on all the base images? I'm just being picky. 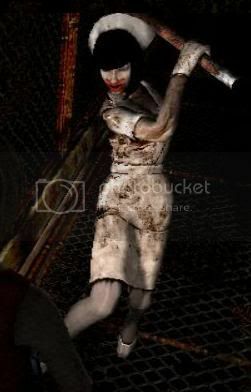 The SH3 nurses don't have the wrapped faces like in the film. It's just a test mockup, to see how it all fits. I'm planing to create two environments, the green background is normal and after the warning sound, paint will peel of the walls and show the rusty background beneath. Idea for the story is this -> Girl carefully walks down the hallway, then the Warning sound sets off (It will be represented as a moving letters over the screen like in the comics). Then environment changes. One or two nurses come to the screen, girl kills them, maybe one of them hurt girl a little. Then lights start to flicker and turn off. There is a scratchy sound of metal being dragged over the floor (BTW if anyone knows how to represent that with letters I would be very grateful ). Lights flicker for a second and you see a Pyramid head dragging his big sword. Lights are off again, Girls tries to shot him but the gun is empty (there is a clicking sound). In the dark there is a scream over the screen an when the lights starts to flicker again you see that Pyramid head killed the girl with a sword trough her chest. There is a lot o movement and I would have to draw every single frame to capture the light. Also there is a problem when lights flicker. It's to complicated, and overlay is doing the work just fine. You are right. But I like the SH1 nurses better. They can blame it on me. New version. It's good, but I think it can be even better. Her breasts are more shapely, but I wonder if they've been a little too big all this time. Quite frankly, they're massive. I did that on purpose. I waned to add fun element to it, that's why she is not very "proportional". EDIT: The newer version and comparison with old one. I added more contrast, and corrected her legs, but I'm currently stuck cause I don't now how to improve more. Comments are really appreciated.